Steven Blackerby is a partner with the firm. A native of Brunswick, he received a Bachelor of Arts degree in English in 2001 from Emory University, where he was a Robert W. Woodruff Scholar and a member of Phi Beta Kappa. Following college, Steven attended the University of Georgia School of Law, where he was a member of the Student Bar Association and the Federalist Society. Steven also served two years on the Editorial Board of the Journal of Intellectual Property Law, in which he published an article on property interests in internet domain names. Steven graduated with honors from the School of Law in 2004. 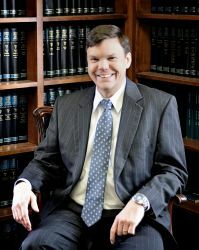 Steven primarily practices in the areas of local-government defense, property disputes, commercial litigation, employment law, and personal injury. Tucker v. Pearce, 332 Ga. App. 187 (2015): Steven represented a police officer who was sued for allegedly allowing an arrestee to commit suicide in a holding cell. The Georgia Court of Appeals held that summary judgment in favor of the officer was appropriate because there was insufficient evidence that any alleged negligence by the officer caused or allowed the suicide. Hoyt v. Cooks, 672 F.3d 972 (11th Cir. 2012): Steven obtained summary judgment for two law-enforcement officers accused of using excessive force by repeatedly tasing a suspect who later died while being transported to the jail. Newman v. Johnson, 319 Ga.App. 307 (2012): Steven represented a County Public Works Director and successfully argued that a plaintiff who was injured as a result of an alleged violation of the ADA could not prevail since she had not established that she was disabled under the ADA. L-3 Communications Titan Corp. v. Patrick, 317 Ga. App. 207 (2012): Steven successfully argued that a trial court abused its discretion by admitting expert testimony concerning the cause of a mechanical malfunction in a personal-injury suit. HNTB Ga., Inc. v. Hamilton-King, 287 Ga. 641 (2010): Steven successfully argued that testimony from the plaintiff’s expert witness was inadmissible in light of Georgia’s standard for expert testimony. Cisco v. State of Georgia, 285 Ga. 656 (2009): Steven represented the defendants in an in personam forfeiture proceeding filed by the Camden County District Attorney under the Georgia RICO Act. In a case of first impression, the Georgia Court of Appeals held that the in personam forfeiture provisions of the RICO Act are unconstitutional because they deprive defendants of the criminal procedure safeguards guaranteed by the United States and Georgia Constitutions. Johns v. Housing Authority for the City of Douglas, 297 Ga. App. 869 (2009): Steven represented a municipal housing authority in a premises-liability action. The plaintiff alleged that deficient security measures within her apartment complex allowed an assailant to gain access to her apartment and assault her. The Georgia Court of Appeals upheld summary judgment in favor of the defendant housing authority on the ground that the plaintiff had failed to establish a causal connection between the allegedly deficient security measures and the assault. Gandara v. Bennett, 528 F.3d 823 (11th Cir. 2008): Steven successfully that damages are not a permissible remedy for violations of the Vienna Convention on Consular Relations. Whitten v. Wooten, 295 Ga. App. 281 (2008): Steven represented law enforcement officers accused of using excessive force on a jail detainee. The Georgia Court of Appeals upheld summary judgment in favor of the defendants on qualified immunity grounds because there was no evidence that the level of force had violated a clearly established right of the plaintiff. Steven lives on St. Simons Island with his wife and two daughters. When he is not practicing law or spending time with his family, he enjoys running and other endurance sports.